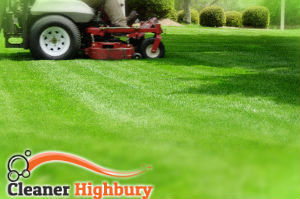 Our company is a leading provider of various gardening services including grass cutting and a great number of Highbury – based customers have already taken advantage of the top quality and reasonable prices we ensure. We do not make customers sign contracts or pay a minimum charge per a grass cutting visit. You will get what you pay for and the quality of the service will be exceptional, as always. Read on and check some of the main benefits every customer gets for booking with us. Professional grass cutting enables you to take pride in ideally maintained yard without putting much efforts in maintenance. In case you have a restaurant or a hotel, your guests will definitely appreciate your efforts to make it a relaxing place. As we are dedicated to the idea of delivering results that exceed our customers’ expectations, we always make sure our gardeners are equipped with powerful mowers and tools that make the project easier to perform. 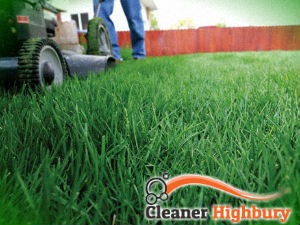 When the grass cutting and edging is delivered, they will also do the edging with a powerful trimmer. Apart from grass cutting and edging, we also offer pest control, coring, turf laying, aeration, fertilising, hedge trimming and many more. Contact us now and get information about the availability of our professionals in Highbury, N5. They can perform a one-off gardening project or visit your property for carrying out gardening maintenance procedures on weekly, bi-weekly or monthly basis. Our operators will gladly make a booking for you. The sooner you call us, the more convenient time slot you will be able to book.